The words hung for a moment in the stale air of the damp sewer chamber. 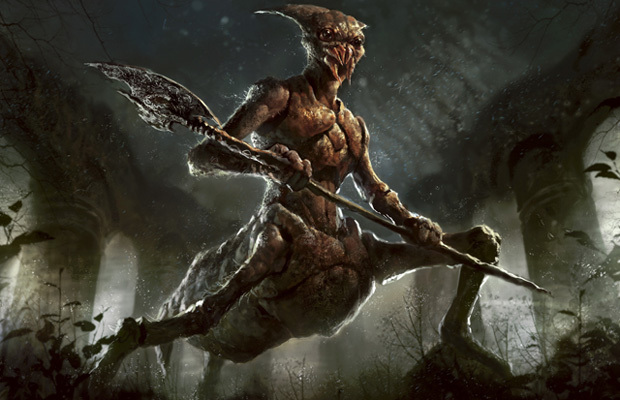 Madarrak knelt opposite the mizzium suit he had uncovered in the muck. His vedalken attendant, Castan, peered over his shoulder into the depths of suit's spherical bell helmet from which the unsettling phrase came. She was staring into the fiery eyes of a glowing human visage that returned her stare from behind the thick glass of the suit's viewing lens. Madarrak tapped the glass with his forefinger. "Are you Erno Zslod?" the aging Izzet mage asked, a hint of impatience in his voice. The face dispersed into a swirling cloud of energy and suddenly reformed. "I am damned." Madarrak held the receiver up to the glass. "This brought us to you. We are looking for Erno Zslod, the Izzet chemister who disappeared from his lab more than thirty years ago." Madarrak rose sharply in frustration and kicked at the muck. Castan took up her mentor's position, face to face with the suit's occupant. She took hold of the helmet in both hands and said, "We are here to help you." After a moment, Castan felt the mizzium grow warm. "What happened here?" she pressed. And as though Castan's question were a release valve for decades of pressure, the voice erupted, "The hypermana focusing lens I designed had worked. I was certain. But after meeting with them, I tampered with it." In an instant, the metal of the helmet became uncomfortably hot, and Castan had to let go. "I altered the design. Something compelled me to do it. When I activated the device, it brought us here. I somehow knew it would. How? How did I know? They had hold of my mind! They must have. I had been sick. Coughing and vomiting—mucus! They did this. And we are damned for it. All of us are damned!" "Who are they? The Izmagnus? Dimir?" Castan looked around. "Golgari? Who?" "Golgari don't come here anymore. They know better." "Who then? Who made you sick?" Castan gave a quizzical look. "Simic?" "When we appeared here, I had transformed into what I am now." "The device reacted with the mizzium suit," said Madarrak. "Where is the dev—"
"The transformation cleared my mind, cured me. Then things came for us out of the darkness. They took no notice of me; I can only assume it was because of my new form. But they collected my attendant, Johrum, who had already begun to change." "Never mind that now," Madarrak snapped. "We must find the device. Where is what brought you here?" Madarrak sifted through more filth. A large, cylindrical canister, cast of mizzium, was revealed to be wedged between the suit and the sewer floor. "This must be it!" "Mentor," Castan said, "what now? Madarrak waved her over. "We recover the device." "That's not what I mean. Look." Madarrak looked. At the other end of the chamber, partially cloaked in shadow, stood a figure staring back at them. The person stepped forward. Its legs were not the legs of person, but those of an insect. Then two more legs. From the waist up, it was humanoid, but protected by a carapace. It wielded a formidable axe. "We are damned!" said the voice in the helmet. Another one of these creatures emerged from the shadows, followed by a third. They spoke in a series of sharp clicks, and although the words were unknown to the Izzet mages, their intent was not lost. The lead creature raised its axe toward them, and the creatures charged. A bluish, crackling energy formed around Castan's hands. "Mentor?" she asked. Castan raised her hands and bolts of electricity arced around her. She let them fly at the attackers. The bolts found their targets, connecting with exoskeletons in three distinct pops. The creatures each tumbled to the ground mid-stride as three lifeless husks. Castan's mouth hung open, and she stood there for a moment, stunned by her own display of destructive power. Madarrak struggled with the canister, "Quickly now, assist me." Castan came to his aid, and together they worked it free. A chorus of countless scuttling legs and indistinguishable clicks permeated the chamber, growing louder, and echoing through the unseen heights. Madarrak strapped the canister to his back, and for a moment he was lost in his own world of impending redemption. Castan's words seemed somehow distant. Something heavy struck his shoulder, dragging his senses back to the present. "Eh?" Instinctively, his hand went to where he'd been hit, and he felt a thick gelatinous mass. He raised his gaze and peered into the shadows that appeared to stretch ever upward. There was movement up there. Before Madarrak could process the thought, it was on him. 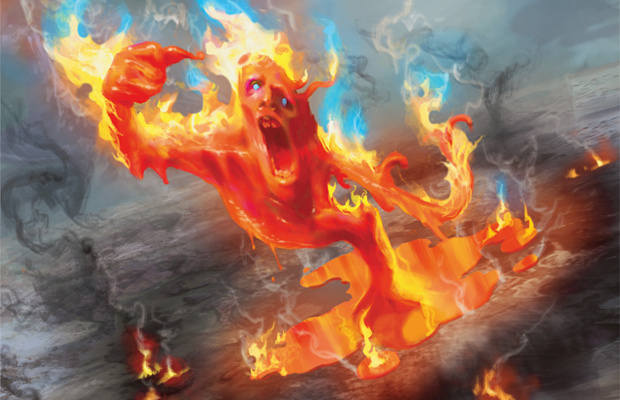 The Izzet mage suddenly found himself pinned against the ground, grappling with a figure that was human in shape, but massive and grotesque. Castan moved to help her mentor, but her path was blocked as dozens of kraul warriors poured into the chamber. She was surrounded. And she did not hold back. The darkness gave way to the harsh light of crackling energy that branched from the attendant's hands. "We are all damned!" declared the voice in the helmet once again. Madarrak struggled to free his hands to cast something, anything. The bulk of the mutated thing was too great. It looked Madarrak in the face and a large translucent blue-green globule emerged from its open mouth. It slid out, held there for a moment by strands of sticky saliva before dropping. Madarrak turned his head in attempt to avoid the mucus, but it struck him on the side of his face, and on its own, began to move toward his nose and mouth. "Johrum!" Madarrak heard the familiar voice, and from the corner of his eye, he saw fire streak across his field of vision. It slammed into the mutant, knocking him off the old man. The fire had taken the vague shape of a man, swirling around the mutant. Without missing a beat, Madarrak raised his hands to his face. He felt the mucus, which had reached his nostrils and the corner of his mouth. He let electricity flow from his fingers. Upon contact, the mucus curled up and fell away. The only sign of Castan was the lighting that arced out from the far side of the chamber. Between mentor and attendant were kraul beyond count. The mutant tore what was left of Erno Zslod in two. There was no time to lose. 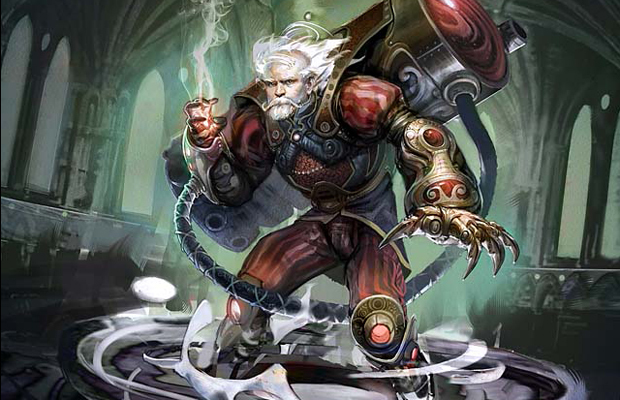 Madarrak extended his arms, and a jet of boiling hot steam erupted from his hands, completely engulfing the mutant. Blisters bubbled up on its surface and it fell to the ground with a horrible shriek. Kraul turned toward him, and there was one thing he thought to do. "Yzaak! Yzaak, to me!" 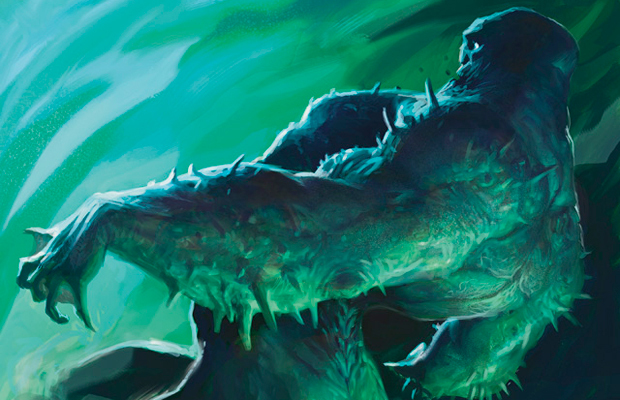 Madarrak's voice was hoarse as he hurtled down the familiar passage toward the hulking Cyclops, who was sitting with his back against an algae-slick wall. Even though Yzaak did not heed Madarrak's calls, the old man found comfort in the sight of the Cyclops. When he reached Yzaak, he allowed himself a moment's rest. He was out of breath, his knees shaking from the strain of the run and the weight of Erno's device on his back. "Come, Yzaak," Madarrak steadied himself on Yzaak's gauntleted arm. "We must get out of here." Madarrak shook Yzaak's arm, and beneath his hand, the Yzaak's gauntlet gave, crumbling in on itself in a cloud of red-brown dust. He leapt back in horror and brought his lamp up to illuminate the scene. The light that washed over the scene revealed the Cyclops to be in a state of decomposition. The mizzium augmentations had corroded. Where flesh was exposed, putrefaction had begun, and fungal growths had sprouted. He backed away and collapsed to his knees, fighting back the urge to scream, or vomit. The Golgari had condemned this place, and he recalled the eyes in the darkness. They were not rot farmers, but watchers. Sentries. 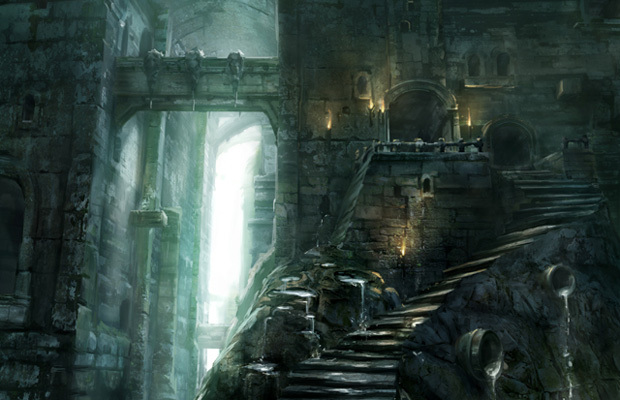 Slowly, Madarrak raised the lamp to the darkness beyond the passageway. Eyes in the darkness. Eyes that were growing larger. He scrambled to get the device off his back. A shuffling was audible from the darkness, and although Madarrak knew members of the Golgari guild were converging on him, he did not care. He had his task. 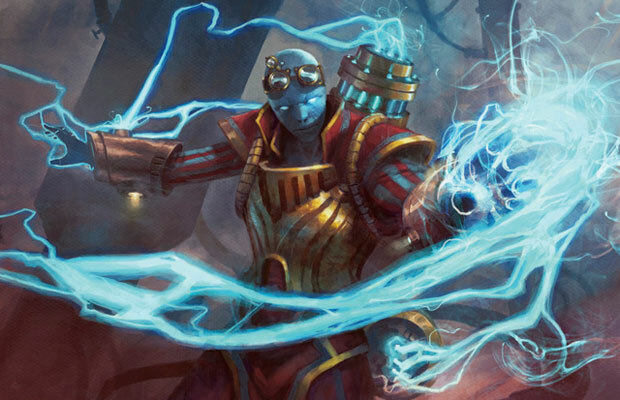 In the brief moments of light, he analyzed the Izzet contraption, allowing his fingers to intuit how it worked. The device suddenly came alive with a buzz, and Madarrak slung it across his back. A cloud of dust swirled around him, and in an instant, he was gone. 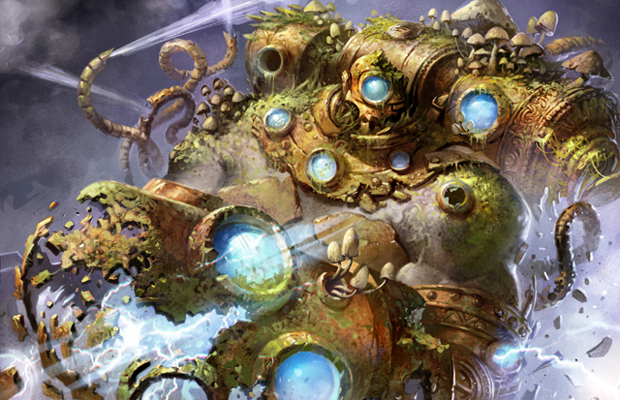 Before the dust settled, Madarrak was bombarded by the familiar crackling of energy, hissing of steam, and clanks of metal on mizzium. He wasn't certain of his precise location, but as the last whiff of the sewer dissipated, he was at least certain that he had returned to Nivix, the guild tower of the Izzet League. There wasn't a moment to lose. Erno's device worked, and he must report that to Niv-Mizzet at once. 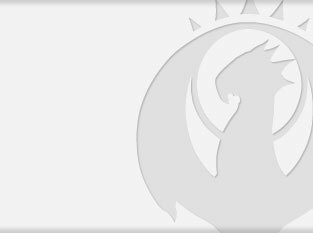 Madarrak returned from his quarters after meeting with Niv-Mizzet. His quarters were little more than a modest cot set into a cramped alcove in a corner of his laboratory. He peeled the layers of clothes from his tired frame. The fabric had grown stiff from dried muck and rot. The old man, back in the Dracogenius's good graces after delivering Erno's teleportal, was to meet with his guild leader once again as soon as he was able to clean himself up and eat something. He stood for a long moment, looking down at the soiled garments crumpled between his hands. His brow furrowed. His thoughts went to the words that followed through the sewers, "There are too many, Mentor! Mentor!" There were too many. What choice did he have? And Yzaak. The Golgari knew what was hidden in their abandoned territory. They were making sure nothing came out. He felt his fingers clench, and as they tightened around the fabric, they wrapped around something solid. Madarrak shook out his balled-up clothes, and the receiver tumbled to the floor, light pulsing from it in the all-too-familiar sequence. It began to slide toward the door. Madarrak pulled his filthy clothes back on. He plucked the receiver from the floor. Niv-Mizzet would have to wait. Or not. For Madarrak, it no longer mattered. He was tired, but he would not leave his attendant to the twisted tests of the Simic. His eyes fell on the monstrous bipedal construct that started this whole thing by smashing its way into Erno's abandoned laboratory. It had been put back together. At the foot of the construct was its schematic. Small piles of metal bits and tools at each corner kept it from rolling up. While Madarrak recognized the designs to be his own, he also noticed notes and tiny diagrams that had been scrawled by another hand—Castan's hand. He looked from the schematic to the construct, and back once more. Castan's adjustments made sense. They seemed so simple, seeing them as they appeared in her rough penmanship, and yet they had eluded him. No time for that now. It had to work. He climbed into the pilot's seat atop the construct's shoulders. He turned knobs, and flipped switches. Power surged into the construct. Everything sounded right. It felt right. With this, he would save Castan. And, failing that, he would bring the whole cursed facility down on itself. He prepared to crank the final lever, when he felt something splash against the back of his hand. Another drip, this one falling upon an array of gauges. As it slid down the glass, he saw it to a blue-green viscous material. The old man's face went white, and he looked up, hiding behind a raised arm. Nothing. His eyes frantically panned across the ceiling of his lab. Still nothing. Horror swept over him, and he brought a shaky hand to his nose. When he pulled it away and looked down at it, his horror was confirmed.